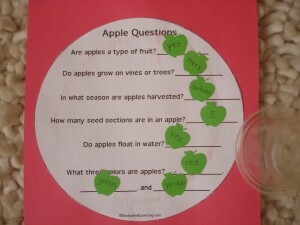 When I did an “apple” search on www.enchantedlearning.com, I came across an “Apple Book” that had a page of “Apple Facts” as well as some “Apple Questions” based on the facts. Andrew was reading but I wanted him to practice his oral reading because he would drop sounds and read too fast. I also wanted to work on the reading comprehension skill of reading for information. I decided to use these printouts to go together but set up as two separate stations. 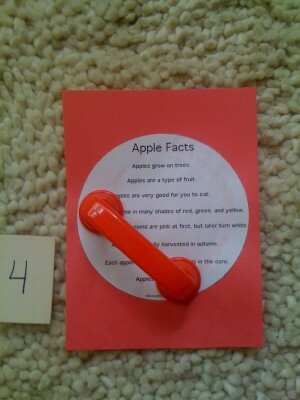 For the first station, I cut the “Apple Facts” printout and pasted it onto a sheet of red construction paper (not necessary but I wanted it to be a little more sturdy and colorful). I added a talking phone (Toobaloo) that we had so he could hear what he sounded like. These “phones” are cool because when you speak into one end, it magnifies your voice allowing you to hear what you sound like through the end by your ear. For the second part of this activity at the other station, once again I cut out the page and glued it onto some red paper. I also wanted a way for him to demonstrate his understanding without needing intelligible speech. This was important for us because his speech was still not very intelligible (except by me) so I wanted to make sure that I wasn’t assuming he was answering correctly so I thought I’d utilize a basic way to provide choices for him. 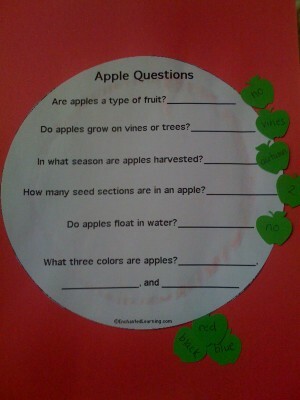 I had some mini apple cutouts and wrote answer choices on either side so that we could read the questions, look at both answer choices and he could choose the side that he thought was correct. This was a great way for me to see his understanding of the facts that he read without needing to be intelligible. It only took me a few minutes to prepare this station but helped give him information, helped him to hear how he sounded and helped him to realize that it is important to pay attention when reading, in this case for information.